Weatherization is often the most cost-effective step toward a more energy efficient house. There are two related aspects to weatherization: air sealing and insulating. Air sealing refers to minimizing the amount of outdoor air infiltrating the house. Insulating means adding to or improving the insulation in the walls, basement, and attic of the house. The process of air sealing may add insulation, and the process of insulating may improve air tightness. Colonial Solar House has a wood frame with plaster interior walls and a brick veneer exterior. When it was built in 1929, there was no insulation added to the walls and only a thin layer of rock wool insulation in the attic and between the floors. This was the standard at the time; insulating walls and attics didn’t become standard until the 1930s. The walls have a 3-1/2 inch cavity to hold insulation, but how does one get the insulation in there and what type does one use? An excellent choice for insulation is cellulose, which is inexpensive and effective. It’s a good strategy to pack it densely in the walls, to improve the air tightness of the house. The cellulose can be blown in by drilling holes in the plaster walls, but this entails significant cost and inconvenience to restore the walls to their original finish. 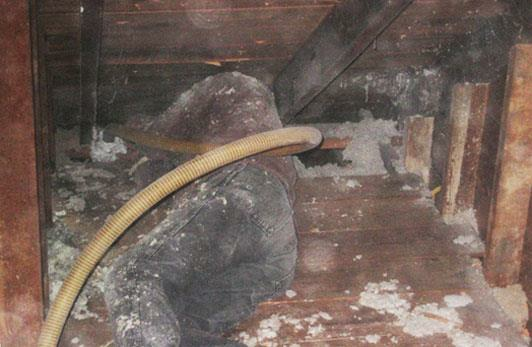 Far better is to blow the cellulose in from the basement, the attic, and the exterior. I found a local company, Capital Weatherization, that was able to access most of the wall cavity from the basement and from the attic. Where that wasn’t possible, they drilled holes in the mortar between the bricks without damaging the bricks and with minimal visible impact on the mortar. Insulation is added to the walls from the exterior through the mortar via a 1 inch hole. The work is barely visible afterwards. Insulation is added to the walls from the attic. Yes, that is a person lying on the floor. I'm sure there are other excellent weatherization companies, although it took some effort to find Capital Weatherization. A company that advertises that it can provide expert weatherization or that it participates in the Ameren ActOnEnergy program may not in fact be up to the task. There are two key tools that a serious weatherization company will use: a blower door and an infrared camera. If these tools are used in the first analysis of your house, that’s a good sign. A blower door is a big fan placed in your front entrance that pulls air out of the interior. One can use this to find the places where air is infiltrating from the exterior. An infrared camera gives an accurate measurement of the temperature of the walls and is used to find places where the insulation is substandard. Using a blower door and an infrared camera together is the most effective way to find out where cold (or warm) air is infiltrating. A blower door pulls air out of the interior to allow the detection of leaks throughout the house. An infrared camera gives an accurate measurement of wall temperature and can aid in the analysis of both insulation and air leaks. In addition to adding dense-pack cellulose to the walls, the Capital Weatherization team added a thick layer of loose-pack cellulose to the attic. However, before they did this, they diagnosed and corrected a major air leak in the attic floor that was not evident to the unaided eye. This was a major issue and could easily have been overlooked by a less thorough weatherization contractor. Loose-pack cellulose is a better insulator than dense-pack cellulose, so it is preferred if air sealing is not an issue. I chose to have the loose-pack cellulose covered with a floor, which added to the expense, but gives me an attic that can be used for storage. A thick blanket of loose pack cellulose is added to the attic and then covered with a wooden floor (optional). 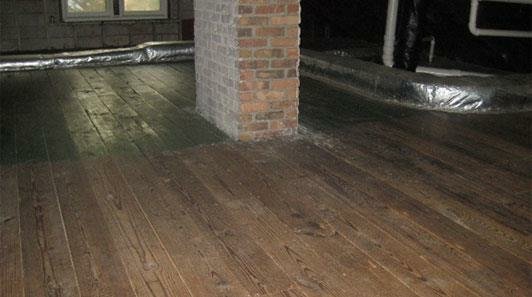 The attic floor prior to weatherization. The ducts were insulated only by a thin layer of fiberglass. Colonial Solar House has a wooden flooring system that is supported by a rim joist. This 1-1/2-inch thick joist is all that separates the basement from the exterior and is thus a weak spot in the home's thermal envelope. Capital Weatherization coated the rim joist in the basement with closed-cell foam (also called two-part foam), which brings the joist insulation effectiveness up to the same level as that of the walls; it also adds air sealing. The rim joist before and after being insulated and air-sealed with closed-cell foam in the basement. A sunroom was added to the house in the 1950s and this room was the coldest room in the house in the winter. I always assumed it was cold because of all the windows. The Capital Weatherization crew found that the crawl space under the sunroom was not only inadequately insulated, but also channeled cold air up the walls. They added closed-cell foam to the crawl space and sealed the walls correctly. The sunroom is now comfortable in the winter and is used year-round. Finally, the Capital Weatherization crew improved the seals around the three exterior doors and the attic door. This was a very quick and inexpensive process. The effect of the weatherization was noticeable immediately. The gas furnace came on much less frequently (so much so that I was at first concerned that it was not working properly). The first utility bill delivered the welcome news that our use of natural gas had been reduced by 30% compared with the prior year, despite the average temperature’s being a few degrees colder. What really surprised me was that our electricity use was also down 30%, with most of this savings coming from the fact that the blower on the furnace, which is powered by an electric motor, was not coming on as frequently. A fringe benefit is that the house is noticeably quieter, with the sound of passing cars on our brick street significantly reduced. Even if you have a more modern home with insulation in the walls, you may benefit from air sealing. The Capital Weatherization crew told me that some of the leakiest houses it has seen were built in the last twenty years. You can get a home energy audit from an independent third party for $50 or contact a weatherization contractor directly. Start at the Ameren ActOnEnergy Home Energy Performance web page. You'll find that there are attractive financial incentives for weatherizing your home, which are taken directly off your bill from the weatherization contractor. It’s a great deal for the homeowner! This step is an investment with a great rate of return, thanks in part to the incentives offered by the Ameren ActOnEnergy program. In my case, the amount I would save in utility bills per year would be about 10% of the amount I paid out-of-pocket for the weatherization. Not only that, this return is tax-free and ignores any increase in energy prices. If I had skipped the installation of a floor over the attic insulation, my annual return would have been 17%. Decreasing your utility bills has the added benefit of increasing the resale value of your house. Debby Auble of Ward and Associates (from whom we bought our house many years ago) tells me that most home buyers today care about utility bills (as any rational buyer should). Weatherization also brings added comfort: the furnace or air conditioner come on less often, the temperature of the house stays better balanced, and drafts are eliminated. If insulation is added to the walls, it significantly decreases the street noise in the house. Expect to spend a few thousand dollars out-of-pocket, depending on the extent of weatherization. If you don’t have the funds available, you can borrow against the value of your home via a Home Equity Line of Credit or a Home Equity Loan or borrow directly from Ameren (if funds are available).